With the recent temperature drop in Kansas City the likelihood of frozen pipes and the ensuing water damage increases. The good news is it can all be avoided. Homeowners should take steps to prevent pipes from freezing rather than waiting until they burst and have to deal with the aftermath. When pipes burst it can lead to costly repairs. The Insurance Institute for Business & Home Safety says a burst pipe can cause more than $5,000 in water damage. Water damage from burst pipes is a reality for many people every winter, especially when freezing temperatures hang around for very long. There isn’t anything you can do to stop the frigid weather, but you can stop the plumbing from freezing. When you wake up one morning to discover there is no water running from the faucets, you probably have frozen pipes. You need to find where within the plumbing system the pipe has burst and then take immediate steps to help prevent water damage. 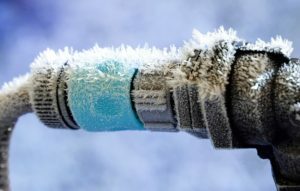 If the plumbing pipes are not adequately insulated, especially pipes that are on the exterior of the home, they can be vulnerable to freezing and bursting. When water inside pipes freezes it causes ice blockages to form. Pipes do not burst because of ice blockages, nor do pipes burst at the spot where the ice blockage is located – usually the pipe bursts where there is little or no ice. It’s the increase in water pressure above the ice blockage causing water pressure to build up and the resulting pressure that causes the pipe to burst. Enclosed plumbing lines, such as those found in attics, crawl spaces and walls are all vulnerable to freezing, especially if there are cracks or openings that allow freezing outside air to reach the pipes. Other areas that allow cold air in are the holes in exterior walls for television, cable and phone lines. The size and composition of the pipes (copper or PVC) also affect how fast ice will form, however they are only minor factors to frozen pipes when compared to the absence of heat, pipe insulation and exposure to subfreezing air. An IBHS study of closed water damage insurance claims identified plumbing pipes and drain systems as leading causes of interior water damage. This type of failure costs homeowners time and money more often than any other source of water loss. The majority of damages claimed were because of corroded, rusty or frozen pipes. If your pipes are frozen but have not yet ruptured you can attempt to thaw them out yourself, or you can call a professional plumbing service. Keep in mind that there is some risk to doing it yourself if not done correctly. Also, if you don’t know where in the lines the blockage is located it’s a good idea to call the pros. Fortunately, frozen pipes can be prevented quite easily and inexpensively. Here are some precautionary tips that can help avoid costly damages. Wrap electrical heat tape around pipes using only one turn every two feet then cover with insulation. Drain the water lines that are subject to freezing, including sprinkler systems and swimming pools. Disconnect the garden hose from the outside of your house. Make sure to close the indoor valves to the water supply. Make sure all sections of exterior walls around pipes are insulated. Insulate around vents and light fixtures to prevent heat from escaping into the attic. Seal any cracks in walls, especially in the area around utility service lines. Open kitchen cabinet doors to allow warm air to circulate around the under sink pipes. Allow faucets to drip cold water on the coldest days. Keep your thermostat at or above 55 degrees at all times. Do not place space heaters or heat lamps inside cabinets or directly under a frozen pipe. Place a 60-watt light bulb in areas where you’re concerned about pipes freezing. Keep away from combustible materials. Frozen pipes are one of the costliest events to homeowners in winter. Frozen pipes that have burst can potentially run into thousands of dollars in damage. Often plumbing lines burst during the middle of the night when temperatures are in the subzero range. When this happens to you, call for professional help immediately. AAS Restoration has a team of experts in making repairs after water damage from frozen pipes floods your home. Call AAS Restoration for a pre-disaster inspection to check all of the plumbing in your home and point out any potential problems that could lead to future frozen pipes water damage. You can reach us at 816-861-1550, or visit us ONLINE.